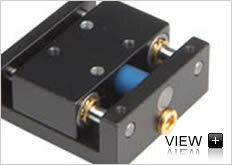 The PP-30 product line of piezo positioner stages is ideal for applications involving precise positioning of small loads. This is achieved through the use of a high resolution piezo motor, recirculating ball bearings, and an optional 5nm linear encoder. PP-30 stages are also stackable in XY or XYZ configurations for either vacuum or non-vacuum enviroments.